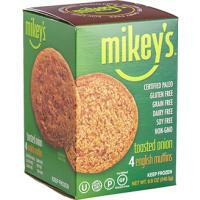 Mikey's Original English Muffins make a meal. Or make any meal better, with just a little almond butter, or anything else you like to add to English muffins. Theyre made with just 7 real ingredients you can trust: Eggs, Almond Flour, Water, Apple Cider Vinegar, Coconut Flour, Baking Soda + Kosher Salt.